According to Paul Jones..."This is my moment!" 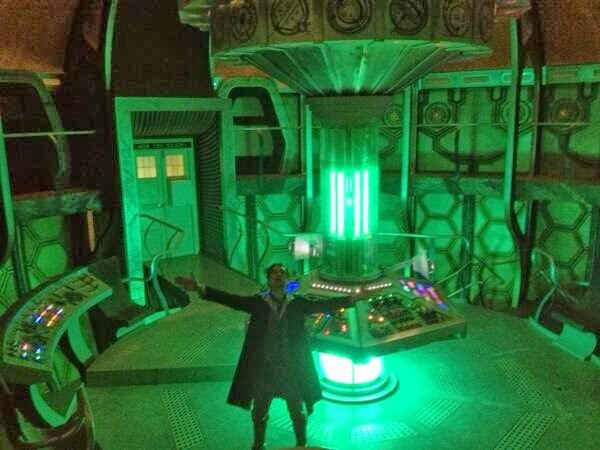 tweeted Paul McGann as he posted this atmospheric photo of himself as the eighth Doctor, arms outstretched, in the console room of 11th Doctor Matt Smith's recently refurbished Tardis." "Judging by his outfit (and less foppish hairstyle) this is the eighth Doctor in his later years, as seen in 50th anniversary prequel The Night of the Doctor, and was most likely taken during filming on The Day of the Doctor." "McGann's seven-minute episode prompted calls from many fans for an entire prequel series following McGann's incarnation. Is this a teaser that it might actually be happening? Probably not – but only time will tell..."
The one bit the article doesn't mention is a comment McGann made at the start of March: "A privilege to spend St David's day in Cardiff with such a friendly, funny crowd of revellers. Thanks to you all." So the picture might have been taken then, if he took a little time out of his day to have a look at the TARDIS set. Which would make a great deal of sense, but probably means he didn't get up to any filming if he was just there for a short time. Although, Davison did work wonders with "Time Crash", so anything's possible. It's worth noting that Patrick Troughton did The Two Doctors not long after appearing in the 20th anniversary special. I'd love to see McGann in a multi-Doctor episode, which seems more likely than his own one-off special or solo miniseries.